Description: After the #183 Play Family Fun Jet had run its course, Fisher-Price revamped the design and came up with this version in yellow and green instead of red and blue. The cockpit and wooden pilot were removed in lieu of a sleek, tinted windshield and the luggage changed from yellow and green to blue and brown. The parental figures got the biggest overhaul of all. A new dark green man and yellow mom with a brown hair were introduced specifically for this set. In 1986, Fisher-Price introduced the #2360 Little People Jetliner. The #2360 comes with the same shaped airplane, yet colored differently, the same luggage pieces, and a family of 4 with plastic molded hair. FPT579 - A white top, green bottom airplane with yellow wings, green engines, and a tinted plastic windshield covering the cockpit. The body has a fold-down door with steps on the inside leading up to 4 seats inside. The plane has room for luggage behind the passenger seats. The plane is pulled with a yellow plastic pull string that is attached to the nose of the plane. HGPP - Mom - Yellow body, fancy eyes and a light brown ponytail. *See Variations below. FPPP - Girl - Lime Green body, light brown sculpted bob. BNPP - The 1985 catalogue shows a green boy with red heat-stamped hair. HHPP - The yellow mom used in this set could also had dark brown hair opposed to light brown. This set was sold in a 12" long, 10-1/2" high, 5-3/8" deep box. 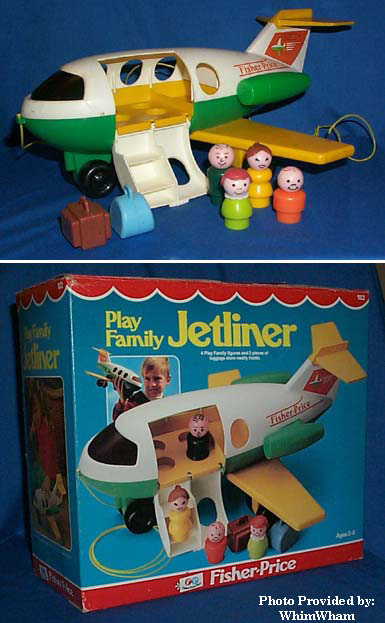 Also see 1970's #183 Play Family Fun Jet.